The Academic Success Center (ASC) is adjacent to Wheeler Library in the OJC Learning Commons. The ASC is staffed by members of our Professional Academic Support Services (P.A.S.S.) Team and our Student Engagement and Educational Development (S.E.E.D.) Team. Our P.A.S.S. Team members are professional subject matter experts who provide Supplemental Instruction (SI) Sessions for a variety of courses (e.g. BIO 111, BIO 201/202, MAT 050). They also assist students with coursework in one-on-one and small group settings, and offer Academic Success Workshops and study skills training as needed. Our S.E.E.D Team is comprised of OJC students who have completed at least one semester of college and have a cumulative GPA of a 3.0 or higher. These individuals help other students become more physically, emotionally, socially, intellectually, and culturally engaged by serving as Course Navigators and Student Ambassadors. In their role as a Course Navigator, our S.E.E.D. Team members have a strong skill set in one or more subject areas (e.g. 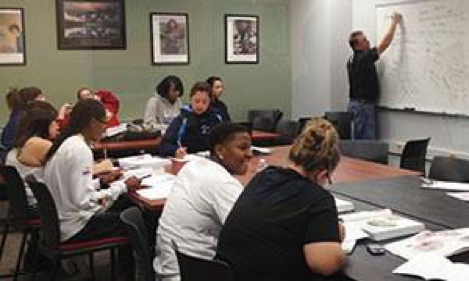 writing, math, history, psychology), and they help our students become more effective learners through individual and small group study sessions referred to as Peer-Led Undergraduate Study (P.L.U.S.) Sessions. As Student Ambassadors, our S.E.E.D. team members assist with campus tours, serve as representatives on student panels, and perform other duties at campus and community events. Text your name and S# to (970) 548-1827. Standard text message and data rates may apply. Stop by the Learning Commons and meet with Hailey Wold, Educational Resource Specialist, or Dr. Chelsea Herasingh, Director of the Learning Commons and Educational Resources.